Bryan Hill (sometimes credited as Bryan Edward Hill) is an author, screenwriter, musician, graphic designer, as well as being an entertainment industry consultant and a prolific comic book writer. He’s worked for Top Cow on Witchblade and Postal, has written numerous screenplays; including episodes for Bruce Campbell’s cult classic horror/comedy series Ash Vs. Evil Dead, and Titans for the DC Universe streaming service. He is also currently writing Killmonger for Marvel and the all new title American Carnage for DC Comics. 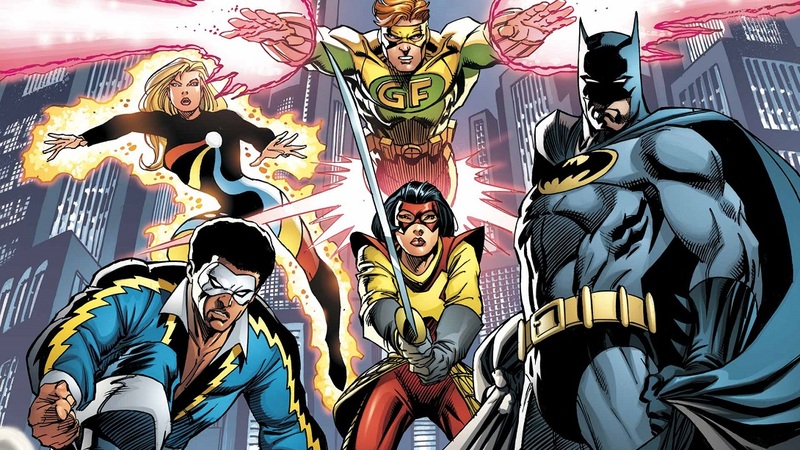 Fellow critics and writers here at DC World, review his work on the brilliant Titans series, which streams on DC Universe. 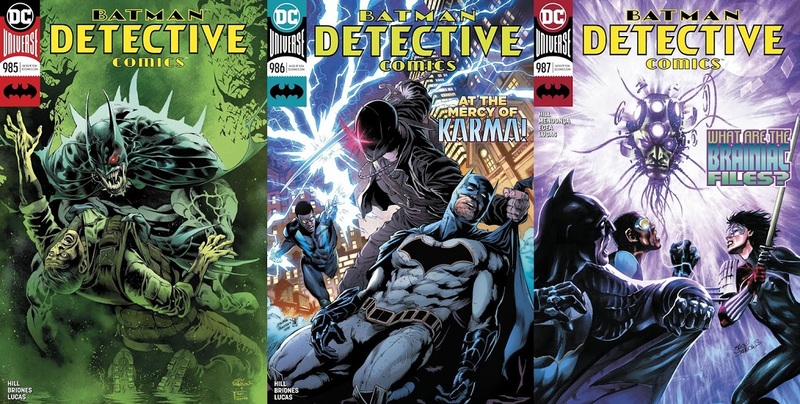 I reviewed his excellent five issue run on Detective Comics for one of the American sites I write for. This story arc laid the foundations for a brand new Batman And The Outsiders title which will hit shelves in early 2019. 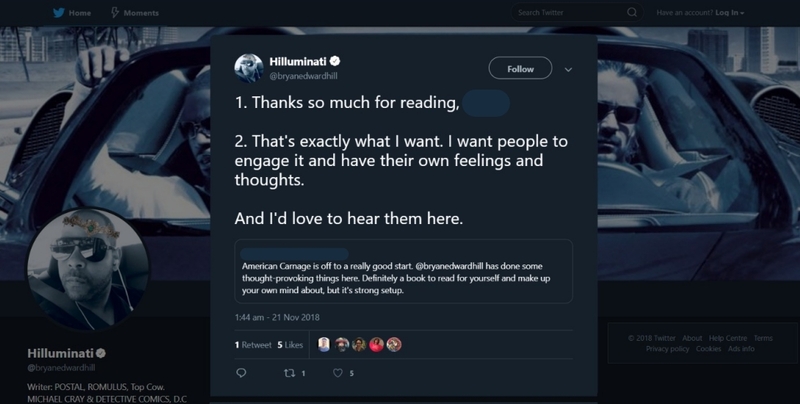 Mr. Hill and I have been conversing online for a few months, largely due to his excellent Twitter conversations with fellow fans. I have always found his helpful comments to aspiring writers inspiring. After a few great conversations, he kindly agreed to this interview. Thanks to Alex (Alec) McDonald for his input, and for a couple of great questions. Steve J. Ray: So, The Outsiders are back! Were you a fan of the classic Mike W. Barr / Jim Aparo run? SJR: How do you feel when you see the print ready comics pages for the first time? Or when one of your TV scripts is brought to life by incredible directors, and actors? BH: Very good question. At the moment, my life is surreal. In all honesty, I didn’t have much doubt that I would be able to tell stories for a living, but I didn’t think I would ever be part of these franchises, other people’s worlds, worlds that I grew up loving. It’s precarious to make your life about contributing to something that you can’t control, where those decisions are made by others. It can be done, for anyone, but it takes a lot of will. Growing up, I applied all of my will to simply not walking away from the path of storytelling. I wasn’t specific about what stories I would tell. Perhaps I should have been and my career could have taken shape faster, but I’m not answering your question, am I? It’s late here in LA and I’m doing these by candlelight. I might be prone to rambling. Mainly, I feel gratitude. A deep sense of appreciation for what I’m experiencing in that moment and all of the experiences that led me there. I’ve come to appreciate adversity more. I see the strength its built in my life. I wake up happy to be who I am. Where I am. Doing what I’m doing. That’s what I’ve always sought for myself, and others. SJR: It’s clear that you’re a long time comics fan. What were your favourites growing up? BH: In terms of characters, Batman was the one I loved the most. 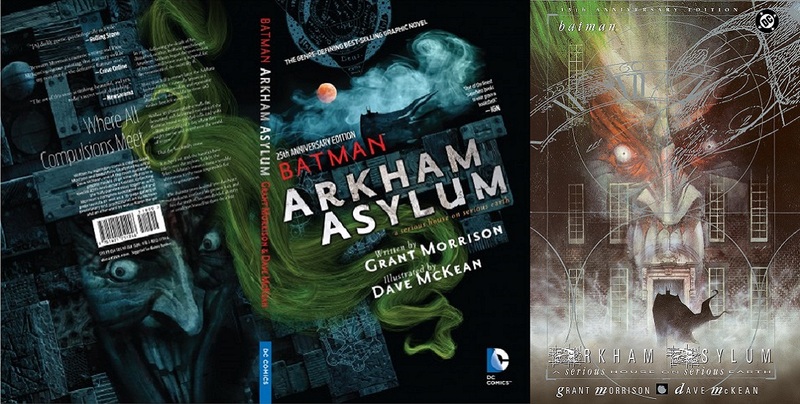 In terms of individual stories, I’d have to say ARKHAM ASYLUM by Morrison and McKean had left the biggest imprint on me. SJR: That’s a true classic. Who are your writing and artistic heroes and influences? (Comics AND/OR non-comics, if you prefer). BH: Alan Moore. Grant Morrison. Neil Gaiman. Frank Miller. Christopher Priest. In comics. Outside of comics, Amy Hempel. Thomas Harris. Stanley Kubrick. Michael Mann. David Fincher. Kathryn Bigelow. SJR: Wow. All of those names are on my favorites list also. Speaking of favorites; Action Comics published their 1000th issue, due to the long run in the 90s where the title was published weekly. But Detective Comics is DC’s oldest title and the one that gives the company their name. What was it like, writing for such a legendary title? BH: Surprising that I was invited to do it. It’s very early in my big two comics career, and frankly, I still feel like a tourist. I’m not “one” with the sense of it yet, and I’m not certain I’ll ever feel that way. I’m pretty different than most people, and by virtue of that, I usually feel outside of things, even when I’m participating. It’s humbling, thinking that you’re a small part of that legacy, seeing people all over the world taking in your vision of this multi-generational story. Humbling. It’s made me step up the acts of gratitude I do in my daily life. I’ve been blessed with a lot of abundance, so I’m compelled to do what I can for others. I’ve been far from abundance, so I know what that feels like. I don’t lose sight of that. It’s made me want to be the kind of person I needed when I was struggling, and never found, someone that could give me a little evidence that I could achieve my goals. SJR: It’s clear that you both know, and love, the Batman family of characters. With Outsiders coming up soon, are you interested in revisiting Metamorpho, Looker, Geo-Force and updating them too? BH: Eventually, I would. The first thing I need to do with the work is explore the characters that carry over from Detective (Batman, Black Lightning, Orphan, Duke Thomas and Katana) and create a few new characters as well. We have interesting new people coming into the story, and a villain I’m very excited to bring to life. He’s a man named “Ishmael” and he’s a different sort of threat to Batman’s power and the peace of the world. SJR: As was Karma in Detective Comics, a very intriguing villain. Are there any characters you’d still like to work on? Either in your comics or on TV? BH: I don’t think about that sort of thing often, working on other people’s properties, but I do believe I could do some good work with Hannibal Lecter, if given the opportunity. SJR: I’d watch, or read the hell out of that! Do you write full scripts with detailed layouts for the artist/s? Strict, tight guidelines with exactly what you want, panel by panel? Or are they basic page breakdowns which you script later, after seeing the art, giving you and the artist/s more freedom? Which process would/do you prefer? Clearly the full script format is closer to TV script style, but still very different. BH: I’m also a screenwriter so I prefer to write full scripts, but I don’t require artists follow them to the letter. Collaboration and trust is important. Yeah… I’m just used to writing full scripts. I think in full scripts, and my outlines are scribbles that wouldn’t make sense to anyone but me. SJR: Are there any artists or writers that you’d like to work with in the future? BH: Many, but I’m hesitant to answer that question. I don’t want to leave someone out. I’m visually driven. There are so many artists I would love to work with on projects. As for writers, I’m still exploring my craft, my voice. I ask myself all the time “Bryan, what is your intention here?” so I would love to work with writers who have more experience in this form. On MICHAEL CRAY I was lucky enough to work with Warren Ellis. Learned a great deal from him. Impressive person, him. SJR: I’ll tell you something else that’s impressive – your workload! Killmonger, Marvel, DC, Outsiders, American Carnage, Titans, Comics, T.V. … how do you stay productive and inspired? What does a typical day look like for you? BH: I wake up. Walk the dog. Meditate and then make coffee. From there it’s a lot of writing, and reading. A little productivity every day. I’m active on twitter while I’m reading because I pause a lot when reading. I pause to think about something I read, and more thoughts come. I’m such a slow reader because I’ll find myself staring into space after a sentence hits me. Twitter is a great place to take small breaks and share ideas. Exercise closes out the day and if I have a little free time, then I might write some music just to decompress. Alex McDonald: With Michael Cray; it’s credited as from a ‘Story by Warren Ellis’ but the series is so different from the Wild Storm. Just how much of it is a story by Ellis? BH: It’s definitely an extension of Warren’s vision, but he allowed me to put a lot of myself in it. Everything I write is a little, personal exorcism. It’s me working something out of myself (and sometimes bringing it back in, if I think its useful). 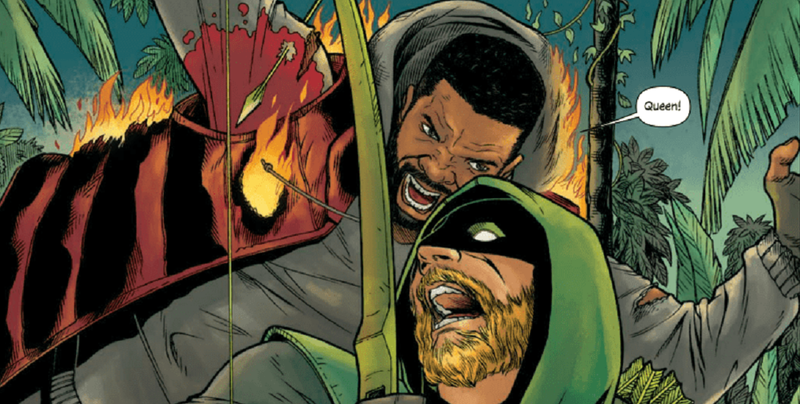 AM: What brought about the plot shift from ‘Michael Cray vs Alt-Justice Leaguer’ to the complex Constantine/ Wonder Woman arc closing the series? I felt like after six issues of that structure, it was time to change things up, take more time and deep dive into a few characters. Cray is a rational man dealing with an irrational nightmare, the waking consciousness of something inside his own mind. It seemed interesting to bring John Constantine into his life, as an antagonist, but also as a bit of a dark mentor. For the true antagonist, I wanted to explore a darker, more sanguine and ferocious Wonder Woman. Her warrior aspects. Her vision of a world that had forgotten her gods and deserved to be punished for it. Engaging all of that with sincerity just needed more page space, so I changed the structure. I’ve been looking at the world, and it feels like “consensus reality” is losing its grip on things. Whether it’s a purely secular materialism, or traditional spiritual/religious structures, it feels like we’re considering things and walking away from a blind belief in what has come before, what’s been taught to us. There’s a rise of esoteric thought, antinomian ways of thinking. I wanted to approach some of those ideas in Michael Cray, leave a little something for the reader to ponder, if they wanted to do so. Lately, I’ve been seeking ways to make my work have more benefit for people. I’m not wise, but I have some experience and I’ve survived some difficult things. I try to put those methods in the work. Cray gave me a good opportunity to consider identity, madness, the spiritual world and its relationship to the material world. AM: How did it feel getting an entire universe of famous characters to play with, such as Evil Barry Allen and Hunter Ollie Queen? BH: Fun. It’s a well-worn lock of comic narratives, but I still enjoyed doing it, hahaha. SJR: It blows my mind that you’re an acclaimed screen and comics writer. Do you have a preference? Are they vastly different processes? BH: I’m minimally acclaimed, but thank you, hahaha. No preference, really. I loved movies, comics, novels and television (and stage plays) since I was a child. I love the expression of soul through narrative. Stories have always been a source of comfort for me. SJR: So, what do you see as the pros and cons of each art form? BH: It’s all a game of space, really. Comics is mathematical in its structure, its panel counts and word space. That’s the trick of it, a trick I’m still learning how to master. SJR: Fascinating. So, finally; is there a question you’ve always wanted someone to ask you, but no one has? What is that question and what’s the answer? What would you like your fans and our readers to know about Bryan Hill? BH: I’m pretty transparent. Not a man of many secrets. Hmmm. Lemme think on it. Hahaha. I still don’t know. I’ll have to pass and handle that the next time we speak. SJR: Brilliant. I’m going to hold you to that! So, there you have it! I’ve thoroughly enjoyed my online chats with Mr. Hill. He’s warm, witty, knowledgeable and still very, very humble. I’ve met and spoken to many comics creators over the last decade, and not many that are as successful as Mr. Hill appreciate where they are as much as he does. 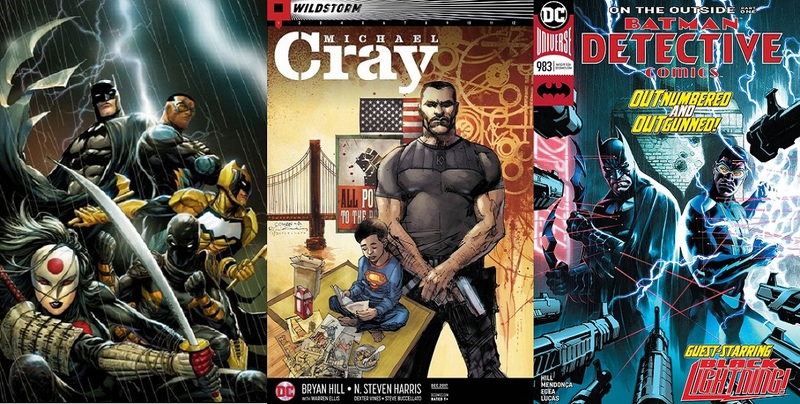 I sincerely cannot recommend Michael Cray, or Detective Comics: On The Outside highly enough. If you want to get in on the ground floor American Carnage #1 by Bryan Hill is available right now! If you want to follow a comics creator online that will educate and entertain you in equal measure, follow Bryan on Twitter @bryanedwardhill. I promise, you’ll thank me for it later. The collected edition of Detective Comics: On The Outside is out in two weeks – on December 5th. Batman And The Outsiders #1 will follow in the first quarter of 2019.